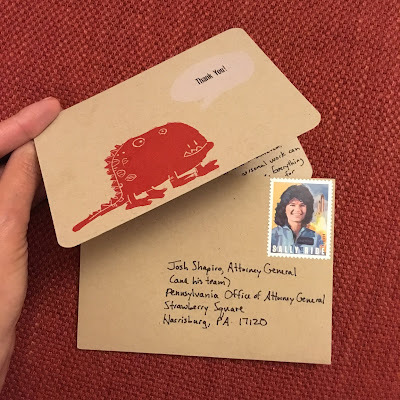 Today, inspired by a loved-one who did it first, I'm sending a thank you note to Josh Shapiro, the Attorney General of Pennsylvania, to thank him and his team for the 1000+ page report listing 300 predator priests in Pennsylvania and detailing decades of illegal coverups and lies. This report changed my life; it was a step toward justice, validating the reality of so many people, not just in Pennsylvania. I'm sharing this thank you idea with you all, because it didn't even occur to me to write a thank you note until someone else showed me hers. Maybe you're like me. If so, you too could send a grateful red monster to the Attorney General of PA.
Those promised adventure pics are coming very soon. Until then, be well, everyone.